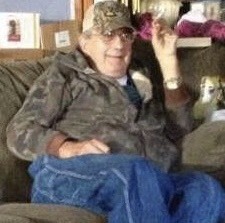 Douglas A. Blackmore 73 of Binghamton peacefully left his home on Sun. Nov. 25, 2018 with family by his side. Doug loved to fish, ice fish, hunt and many other things, mostly he loved his family. Doug drove tractor trailer for many years. He was predeceased by his wife of many years, Bonnie L. Blackmore, his daughter, Wendy L. Blackmore, his mom, Beatrice Butler and many others. Doug leaves behind 2 daughters, Lula & Richard Aldrich, Winifred & Chris Curtis, 12 grandkids, Chantel, Nicole, Nathan Atkinson, Yvonne, Terry Jr., Venus, Skylar Scott, Robin Curtis, Kenny Aldrich, Candice, R.J. Curtis, Alyssa Summer, Hunter Lee Aldrich, 10 great grandkids, his brothers, Paul & Ginger Butler, Frannie & Pam Butler and Terry D. Scott Sr., his side kick. Private Services will be held at the convenience of the family. Online condolences may be made at: www.omaddenfh.com. Arrangements by the Osterhoudt-Madden Funeral Home 69-71 Maple Street Harpursville.